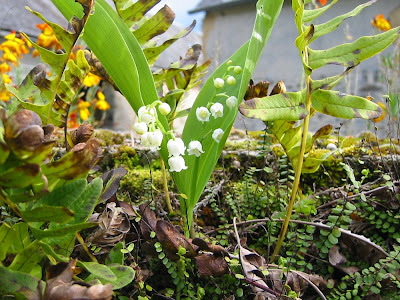 The first of May, Beltane, Workers' Day is a holiday in France and is traditionally marked by the giving of Muguet de Bois, the Lily of the Valley to family and friends. Happy May Day, to one and all. Not too useless a day compared to the last few. I've planted the Fagiolo di Spagna Bianco, known to you and me as Runner Beans, Spanish White but I didn't know that before I bought them and now, well, they are a very large bean, as big as the beans in the runner bean Painted Lady but entirely white. They should make very good "Greek Beans in Sauce", as I hoped when I bought them. My favourite runner is actually White Emergo, the rough green pods have a great flavour and the seeds are useful in cooking but nothing like the size of the Spanish White. I hope the curse of the French on runner beans doesn't affect these seeds from Spain via Italy. The frame for the beans is an interesting construction of harvested hazel poles from the hedges on the farm and bamboo canes from the bamboo plant in Ouville. I don't think the canes are very strong but I'm going to give it a go, using them in pairs. Even the string was scavenged from the debris left around the fields by the hay baler last summer. I've also started some sweetcorn in pots and mowed about a quarter of the lawned areas before the rain started again. The weather is set to improve over the next few days, so I'll be busy won't I? Is that all for the month of May?